Ginger essential oil is usually added to steam and inhaled to help relieve cold or flu symptoms. Ginger essential oil is also used as a massage oil. 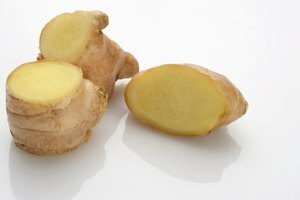 You can purchase essential ginger oil at any health food store. However, ginger essential oil, like other essential oils, can be expensive. You can make your own ginger essential oil at home using a few ingredients you can buy at your local supermarket. 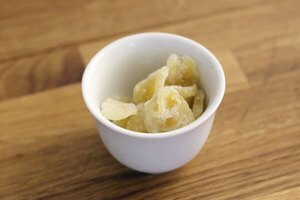 Rinse one cup of chopped fresh ginger (including the skin) and let dry for several hours. Pour one 1 ½ cups of olive oil in an oven-safe bowl. Shred the chopped ginger using a clean, dry cheese grater and transfer to the bowl. Stir the olive oil and shredded ginger. Place the mixture in the oven and let it simmer under low heat (150 degrees Fahrenheit) for about two hours. Cover a bowl with unbleached cheese cloth. Place a rubber band around the bowl to hold the cheese cloth in place. Pour the ginger oil into the bowl. Remove the rubber band, twist the cheesecloth and squeeze the remaining oil with clean dry hands. Transfer the ginger oil into vials or bottles. Use a funnel to prevent messy spills. Label the bottles with the exact date when you made the ginger essential oil blend. The normal shelf life of essential oils is about six months. After this time, the ingredients begin to decompose. Store the ginger essential oils in a cool, dark place.